Windows 10 is officially launching in just two days. 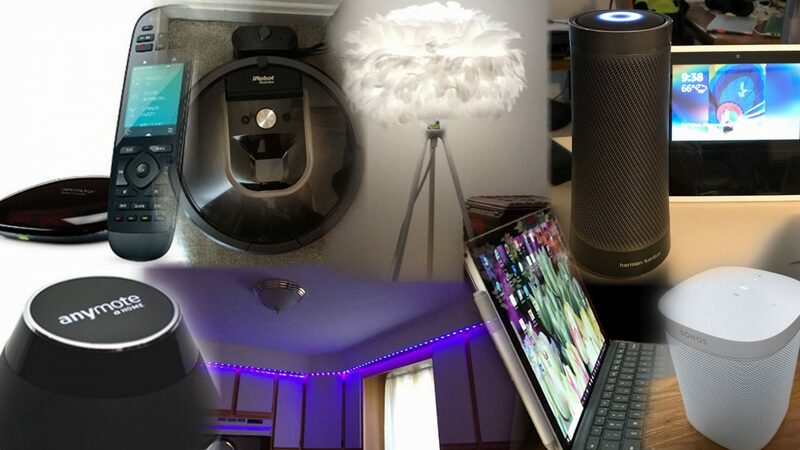 There are lots of great improvements, but if you are a Home Entertainment enthusiast, there are things to consider before making the decision to upgrade. I’m very happy with Miracast for screen mirroring, but not so happy about the lack of great support for streaming to DLNA DMR devices which was present in 8.1 but has gone missing in 10. Everyone needs to make their own decision on whether or not to upgrade, and if you are a Home Entertainment user and doing a lot of streaming, my observations may help you decide. If you are currently using DLNA “Play To”, your choices in Modern/Universal Apps will be limited. 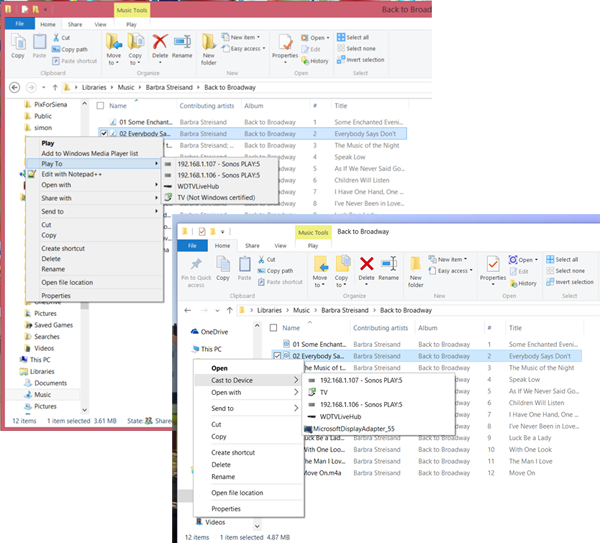 In Windows 8.1, from the File System (classic Windows Explorer Interface) you could right click a file, then Play To – and any DLNA DMR devices would be available. In Windows 10, this is still present, but it’s called Cast To Device. This isn’t as nice an interface as the one provided by Modern Apps (in my opinion). 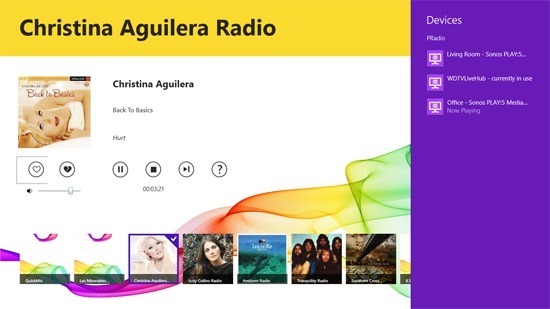 In Windows 8.1, Modern Apps could implement something called a “Play To” contract, which enabled you to stream to DLNA DMR devices. I use this constantly with my Surface Pro 3 and Music to send music streams to my Sonos Living Room Speaker. 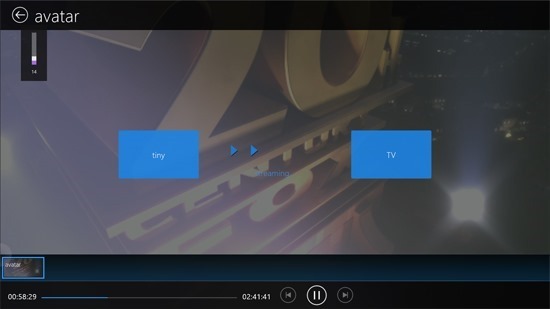 I can also send to me WDTV Live Hub which is connected to my receiver, etc. 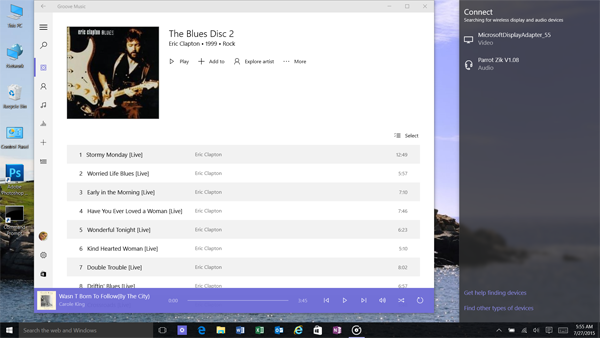 The new Groove Music in Windows 10 doesn’t have the ability to stream to DLNA devices. Yes, it can stream to my Bluetooth headphones or any other Bluetooth device like Bluetooth speakers, but I’ve been using DLNA, and now it’s gone missing. 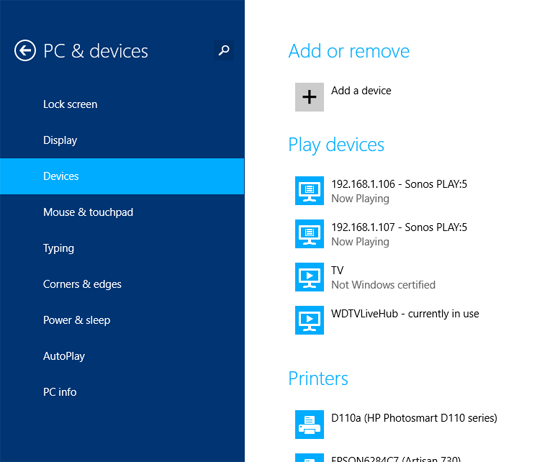 The Connect Tab in Windows 10 supports Miracast and Bluetooth audio. But if I want to stream to my Sonos or WDTV Live Hub, I’m out of luck. 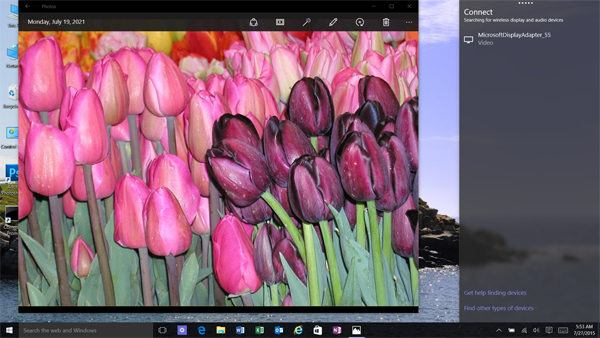 Windows 10 has no such functionality in the Photos App. Only Miracast is supported through the Connect tab. There’s no Cast To DLNA functionality. 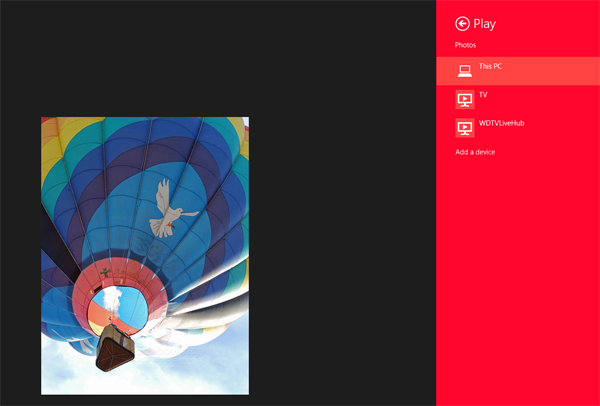 In Windows 8.1, there were multiple store apps that supported the Play To feature. MediaMonkey, VLC, etc. This functionality isn’t present for these apps in Windows 10 and these apps have other issues under Windows 10. So as of now, I really don’t have a way to stream Music to my DLNA devices OTHER than through Windows File Explorer. And that disturbs me. 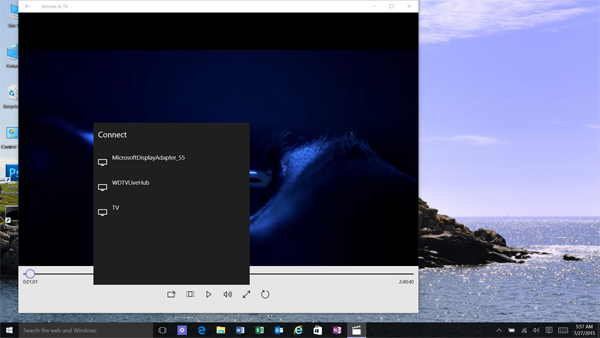 Miracast – is it better in Windows 10? Microsoft has made some changes and more of this functionality is handled by the operating system. But many folks in the Windows Insider Forums are actually reporting that systems that worked properly with Miracast under 8.1 aren’t doing so well with Windows 10. On some systems, this may be due to drivers. But it’s worth noting that there are plenty of reports of “not working”. Intel WiDi – Older systems from the Vista era may have included Intel’s proprietary Wireless Display technology. 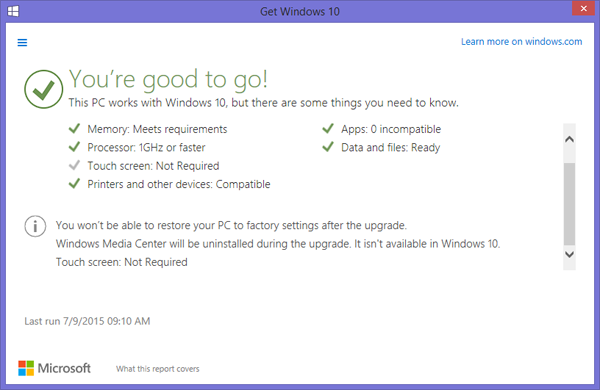 The upgrade disables this apparently and while Microsoft has said that customers can just reinstall the Intel WiDi app, reports from customers say otherwise, that it won’t install. Bottom line, take a good look at your multimedia streaming needs, watch the Microsoft Forums, and don’t rush out to upgrade on day one. 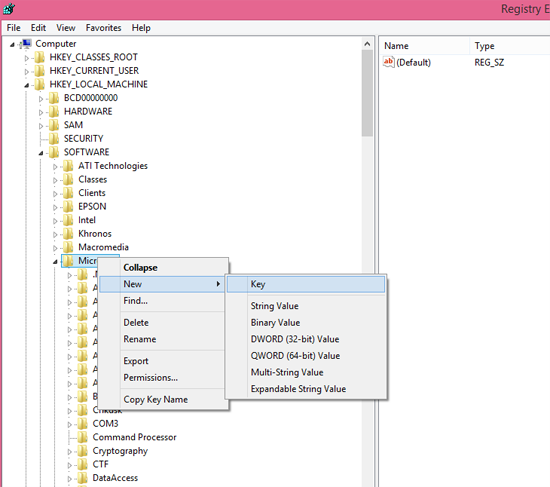 If you read my blog posts this Spring on enabling legacy DMR’s in Windows 8.0, you know that you had to create individual entries and modify them for each device you have in your home. Gabe Frost from Microsoft has just shared a single Registry key that will enable all your legacy Digital Media Renderers to appear on the Charms/Devices/Play tab in Windows 8.1. HKEY_LOCAL_MACHINE\Software\Microsoft\PlayTo with a DWORD ShowNonCertifiedDevices with value 1 will enabled all your legacy Digital Media Renderers. Without this modification, Windows Store Apps won’t be able to use the Play function to send content to your non certified devices. 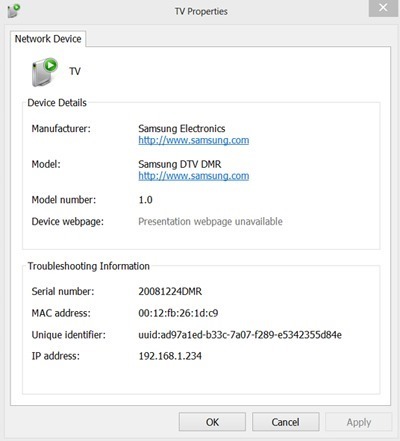 I have an older Samsung TV which without this registry key, is not capable of sending mp4’s on my hard drive to my TV using the Device/Play Charm. 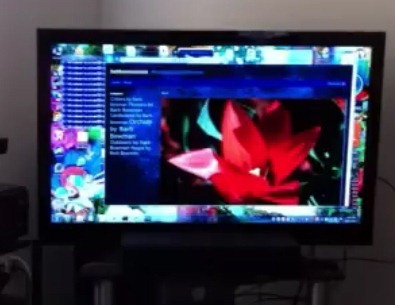 You can see below that it appears as TV, Not Windows Certified. As before, your first step is to insure your device works as expected on the Classic Desktop with your Photos, Music, and Videos (depending on the device, not all would be appropriate). The new Dword should be named ShowNonCertifiedDevices. After you have created the key, right click, edit and change the value from 0 to 1. End result: My non certified Samsung TV shows up in the Play menu from the Devices Charm and successfully can send to my TV. 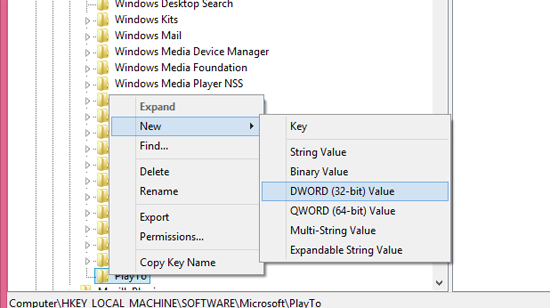 Note: You alternatively could use HKEY_CURRENT_USER\Software\Microsoft\PlayTo with a DWORD ShowNonCertifiedDevices with value 1 which would limit functionality on a per user basis. My last post detailed the process to add Microsoft non certified devices to the list of supported “Play To” devices in Windows 8 Modern UI Start Screen Apps so that they appeared in the Charms/Devices menu. Once again, if you experiment with this, you will need to verify that your device is a DMR (digital media renderer) that works from the classic desktop explorer/libraries interface by right clicking an asset and verifying Play To appears and that you can successfully send the media to the device). I already knew my circa 2009 Samsung LN52B750 series TV was not the greatest Play To client (which is why I have been using the WDTV LIVE Hub) but I wanted to enable it to see what kind of results I would get. The LNB Samsung TV series is neither certified by the DLNA.org folks or by Microsoft (just as my Sonos speakers are not certified by either organization). 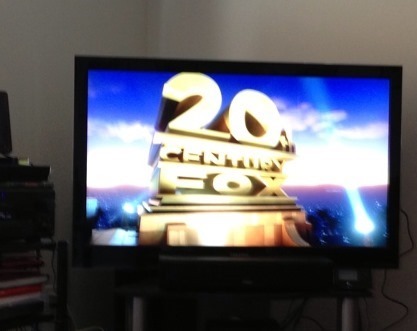 In DLNA years, 2009 is ancient, and in TV cycle years, prehistoric. Samsung stops issuing firmware updates after 9-12 months so there was really not much hope of improving the DLNA experience after that time. Aggravating, but true. So for most people, the iffy DLNA experience (due to codec and transcoding support) the Microsoft decision to not show these uncertified devices is justified. It would be a support nightmare. But, if you are a geek and accustomed to tinkering with the registry, etc., once again, enabling these devices let you experiment. Again, this is for geek enthusiasts only and unsupported. Backup your registry and the subkey before you begin. Proceed at your own risk. Note: I performed this exercise on my Surface Pro and Surface RT with success. To add the TV to the whitelist, once again, from the Network window, I right clicked the media icon for the TV and accessed the properties. Since the DeviceShims registry already listed Samsung Electronics,all I needed to do was add the subkey for Samsung DTV DMR and the 32 bit dword IsLegacyDMR and set the hex value to 1. I did have to take ownership of the Samsung Electronics key and give local users full control in order to perform this modification. Next step was to reboot. Concurrent with my experimentation with non MSFT certified DLNA DMR’s, I also was looking to be able to play MKV files and had downloaded the trial of Cyberlink’s Power DVD Mobile from the Windows 8 App Store. (I’ll have more to say about this app soon, but I had a WOW experience; it’s one awesome program). I opened my Avatar MKV and it played beautifully on the Surface Pro. Now the moment of truth, could I send to my Samsung TV through the Devices menu. 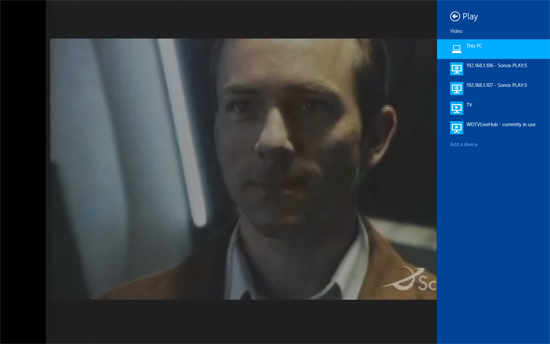 You can see in the screen capture below that both my TV and WDTVLiveHub are available from the Devices charm. And the output to the TV worked perfectly. The picture looked great and there was no lagging/glitching (and sound was in sync – I run audio from the TV out to a home theater system via Digital Optical SPDIF). I won’t say it was a good as watching the original Blue Ray, but close. This same TV has had trouble with mp4’s using Play To where it doesn’t correctly handle the aspect ratio at times. And when I set still digital images via the Device charm, they displayed beautifully. Today I’m one step closer to giving up my iPad as my Surface RT can now perform one more task on my must have list. 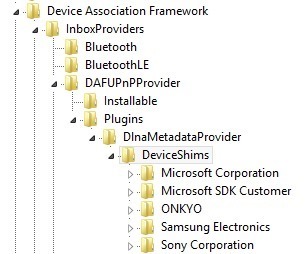 Full DLNA Play To sharing from the Charms bar/Devices for non Microsoft certified devices was a biggie on my list. 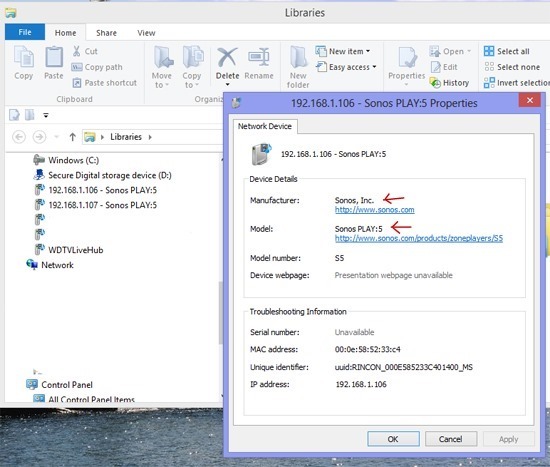 A little history: In Windows 7, Microsoft introduced Play To which used the DLNA spec to let me send media from my computer to a DLNA DMR. I had so so results with my 2009 Samsung TV due to poor transcoding support, but great results with my WDTV Live Hub and my SONOS speakers. The so-so experience on my TV and the not wonderful experience on other device by many many people caused Microsoft to rethink their strategy for Windows 8 and come up with their own certification process for devices to “insure” a good experience. This translated into a restrictive policy for Windows 8 Start Screen/Metro/Modern UI Apps where only MS certified devices would appear in an applications Settings: Devices menu. What this meant for me was that I could no longer send music to my SONOS speakers from these Apps, although I could do so from the classic Desktop-Explorer-Libraries view. I certainly was annoyed and disappointed. To me, this meant that Microsoft was going down the closed eco-system route and emulating Apple. DLNA is an open standard, and there are tiered requirements. MS was seeking to bulletproof the experience, but in the process left many of us hanging. I certainly wished for, and expressed my desire for, an advanced user setting to “Show non MS certified devices”, and I still think that is the necessary change that Microsoft needs to make. Others in the geek world wanted a way to use their non certified devices and Rafael Rivera came up with a way for x86 based Windows 8 computers to do just this. He didn’t find a way to do this on Surface RT. And that’s where I most wanted this functionality. Note: The information that follows applies to Windows 8/Windows RT and I have tested on my Surface RT, my Surface Pro, and a Windows 8 desktop. So I started looking at the registry. What I am about to describe works on both my Surface and Surface RT tablets but it is the only way so far to enable this functionality on RT. Before you start,verify that your device supports Play To in the classic desktop/explorer/libraries interface. To do this, right click a supported media file in a classic library and verify the Play To menu appears and that you can successfully send to your target device and it plays the media you selected. When expanded, it shows devices from just a few companies. Do you find the IsLegacyDMR an interesting dword? If you look at the entire exported key, it is one of those AHA moments. What follow is for geeks only. Use at your own risk. Back up your registry and back up the specific key. And use what follows entirely at your own risk. Obviously you will want to at least use the touch/type keyboard for this process. First, the DeviceShims key is “protected” and you will need to take ownership and give yourself full control. 1. Right click the DeviceShims key, then click Permissions. 2. Click the Advanced tab, then click the Change hyperlink next to the Owner. You can use your Microsoft account for this. Second, you will need to determine the exact information on the device(s) you want to empower to use the Start Screen Play To functionality. Third, You need to create the registry values for your device(s). 2. Under the just created key, create a new subkey for the model (Sonos Play:5 in my example). Here’s my Surface RT happily sending the output of the PRadio App (Pandora) to my Sonos. One of the great things about “community” is that you meet talented people virtually who come up with neat ways to enhance Windows features. Jensigner has developed just such an add-on called OneShot which I see all kinds of interesting uses for, such as real time presentation work, education, and more. Basically this app takes screen captures of whatever is on your desktop and sends them to a folder named PlayTo, to enable you to quickly take advantage of a neat feature built into Windows 7. 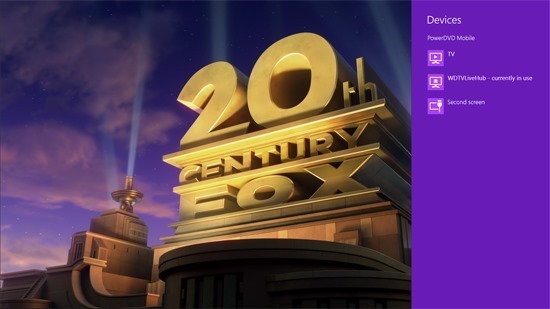 Open the folder, range select the images you’ve just captured and send to your PlayTo DLNA enabled TV. To demo this, I opened my photo blog in IE9 and captured the desktop. Then, I opened the PlayTo folder and sent it to my DLNA enabled Samsung TV. Cool!